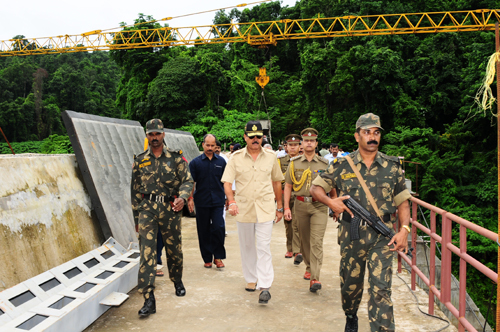 Port Blair, July 11: The Lt Governor, Lt Gen (Retd) A K Singh, PVSM, AVSM, SM, VSM visited Dhanikari Dam today and inspected the progress of work on raising of height of the dam. Raising of Dhanikari Dam by 5 meters is a landmark project, aimed at mitigating the water shortage of South Andaman area. The construction work is being taken up by National Hydroelectric Power Corporation (NHPC) and is likely to be completed shortly, said an official communication. The Chief Secretary, Shri Anand Prakash, senior officers of the Administration as well as NHPC were also present on the occasion.